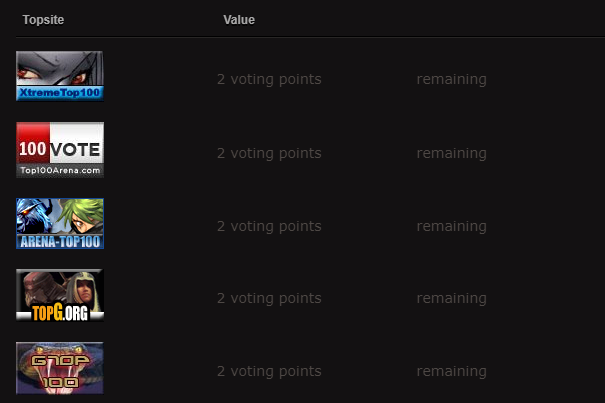 I haven't made any changes on modules/vote. Sometime it's on all vote sites, I even tried to reinstall FusionCMS and still nothing. It stay like this with a days. Personally, i never saw such an issue on any of my friends' websites and i cannot say anything for sure without debugging and since i dont even know your website's url, fcms version or etc i assume there's some db conflicts and you probably need to wipe your vote_log table. also make sure your vote module is configured probably, because iplock config sometimes could cause such a problems. also make sure you've configured vote sites properly. The problem was in 'vote_log'. I empty the table and now everything looks alright. Thank you <3 ! EDIT: The problem is solved only when emptying the table. 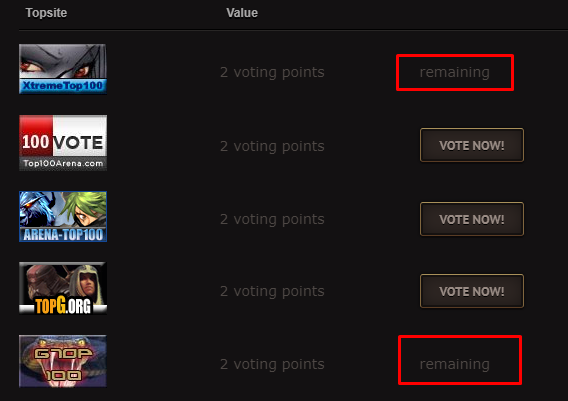 After voting, they have to wait for 12 hours, but instead of those 12 hours they get the same message again -"remaining". I have to empty the table everytime, which is uncomfortable. Please for a fix, I am inclined to pay! I tried put the module from a fresh Fusion (6.2.1) and nothing happens. I am using Chrome latest version. Last edited by Kepo; 11-11-2018 at 07:17 PM. For a more accurate solution and troubleshoot to understand why the table isn't cleaning up automatically how it should, check client Cookies and server time. Last edited by Kepo; 11-30-2018 at 09:12 AM. Php version you are using? Edit: Ooh, I see now, and I have three solutions for you that are highly likely to work! Everytime someone visits your website he/she connects through an IP address given by Cloudflare and not through his/her own IP address. However, Cloudflare has only a limited amount of IP addresses, so the chances are high that User1 and User2 are connecting to your website through the same IP address. User1 has voted, and so is that particular IP locked out from voting again (you've set this on and can turn it off somewhere in Fusion CMS). However, that means User2 can't vote now even though he/she waited for 12 hours, and since there's no vote record on his/her account there isn't any time of voting to relate to thus resulting in the simple "remaining" message. Here's an explanation of what happens in Cloudflare language. You can confirm this IP address issue by taking a look at a website like this, as well as the Last IP and Current IP in your User Panel of Fusion CMS. Last edited by Sinatra; 12-11-2018 at 01:56 AM. Do I have to do all three steps or just to disable the IP block? Sorry, late reply. Disable IP block will do fine. It's one of three options, they are not steps.